We at Insider Monkey have gone over 700 13F filings that hedge funds and prominent investors are required to file by the SEC The 13F filings show the funds’ and investors’ portfolio positions as of December 31st. In this article, we look at what those funds think of Everest Re Group Ltd (NYSE:RE) based on that data. Everest Re Group Ltd (NYSE:RE) has seen an increase in enthusiasm from smart money in recent months. 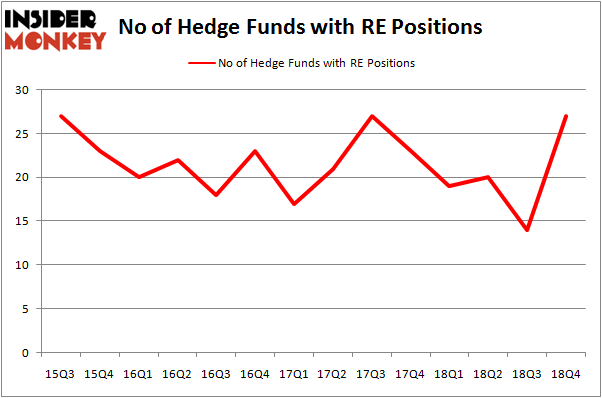 Our calculations also showed that RE isn’t among the 30 most popular stocks among hedge funds. Let’s check out the recent hedge fund action encompassing Everest Re Group Ltd (NYSE:RE). At Q4’s end, a total of 27 of the hedge funds tracked by Insider Monkey were long this stock, a change of 93% from the second quarter of 2018. Below, you can check out the change in hedge fund sentiment towards RE over the last 14 quarters. So, let’s see which hedge funds were among the top holders of the stock and which hedge funds were making big moves. 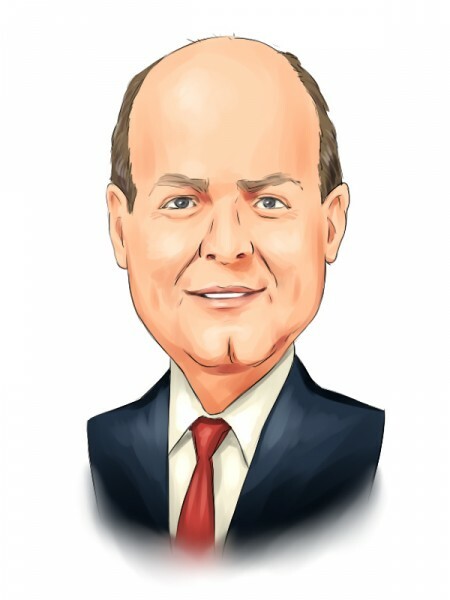 According to Insider Monkey’s hedge fund database, AQR Capital Management, managed by Cliff Asness, holds the biggest position in Everest Re Group Ltd (NYSE:RE). AQR Capital Management has a $271.6 million position in the stock, comprising 0.3% of its 13F portfolio. Sitting at the No. 2 spot is GLG Partners, managed by Noam Gottesman, which holds a $37.7 million position; the fund has 0.2% of its 13F portfolio invested in the stock. Some other peers that hold long positions comprise Jim Simons’s Renaissance Technologies, Brian Ashford-Russell and Tim Woolley’s Polar Capital and Dmitry Balyasny’s Balyasny Asset Management. As aggregate interest increased, some big names were leading the bulls’ herd. Balyasny Asset Management, managed by Dmitry Balyasny, established the most outsized call position in Everest Re Group Ltd (NYSE:RE). Balyasny Asset Management had $21.8 million invested in the company at the end of the quarter. Ken Griffin’s Citadel Investment Group also made a $6 million investment in the stock during the quarter. The following funds were also among the new RE investors: Gregg Moskowitz’s Interval Partners, Michael Kharitonov and Jon David McAuliffe’s Voleon Capital, and John Brandmeyer’s Cognios Capital. Let’s go over hedge fund activity in other stocks – not necessarily in the same industry as Everest Re Group Ltd (NYSE:RE) but similarly valued. We will take a look at TechnipFMC plc (NYSE:FTI), Lennox International Inc. (NYSE:LII), NVR, Inc. (NYSE:NVR), and Reinsurance Group of America Inc (NYSE:RGA). This group of stocks’ market caps match RE’s market cap. As you can see these stocks had an average of 25.75 hedge funds with bullish positions and the average amount invested in these stocks was $510 million. That figure was $447 million in RE’s case. NVR, Inc. (NYSE:NVR) is the most popular stock in this table. On the other hand TechnipFMC plc (NYSE:FTI) is the least popular one with only 21 bullish hedge fund positions. Everest Re Group Ltd (NYSE:RE) is not the most popular stock in this group but hedge fund interest is still above average. This is a slightly positive signal but we’d rather spend our time researching stocks that hedge funds are piling on. Our calculations showed that top 15 most popular stocks among hedge funds returned 19.7% through March 15th and outperformed the S&P 500 ETF (SPY) by 6.6 percentage points. Unfortunately RE wasn’t in this group. Hedge funds that bet on RE were disappointed as the stock returned 1.2% and underperformed the market. If you are interested in investing in large cap stocks, you should check out the top 15 hedge fund stocks as 13 of these outperformed the market. Here is What Hedge Funds Think About Jack Henry & Associates, Inc. (JKHY... Here’s What Hedge Funds Think About The Gap Inc. (GPS) Were Hedge Funds Right About Souring On WestRock Company (WRK) ? Here’s What Hedge Funds Think About IDEX Corporation (IEX) Did Hedge Funds Drop The Ball On Kansas City Southern (KSU) ? Were Hedge Funds Right About Flocking Into Altice USA, Inc. (ATUS) ?